I'm using webalizer to analyze my web server access log files, and I noticed that many IP addresses could not be translated into a name automatically, resulting in an "Unresolved/Unknown" percentage of about 50. I would like to have as many hosts grouped in .com, .net and the country codes as possible. I came across this article on optimizing Apache server performance. They amongst others recommend turning off HostnameLookups completely in Apache for performance reasons and do any hostname lookups only when processing the log files. I found out that webalizer has its own DNS lookup mechanism and tested that a little. But still about half of the IP addresses could not be resolved. Then I came across this geolizer patch for webalizer. It uses the GeoIP library to generate faster and more reliable geographic statistics than using the default DNS suffix method. 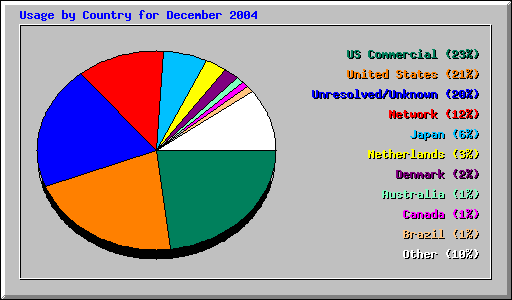 Now I only have 20% unknown, and that seems to mostly come from hostnames that already have been resolved in the past. From now on I will only be using IP addresses and I have good hopes that the hit rate then will be even better. Today I saw an announcement for the first 1.0 Release Candidate of Mozilla Thunderbird, an email reader. Besides a POP3 and IMAP email client it also is a RSS feed reader, so I can use it to easily monitor my main sources of news (both in Dutch): nu.nl for general news and Tweakers.net for the technical news. So far, I like it. It seems to do everything one would expect from a modern email client and the RSS reading is going fine as well. Haven't tried out newsgroup reading yet. I also use Mozilla Firefox nowadays as web browser and like it as well. I especially like the tabbed browsing windows, e.g. when googling for something and clicking on a few links so they can all load before I start reading them. Today I released a Trackback enabled version of SPHPBlog!